First let me just start off by recognizing that this post (about Christmas) is well over a month behind. In my defense, I did have the video tour up on YouTube last month, watch it here. I just got busy with work, trips, parties, family… you know how December goes!? So, I finally took down all of my Christmas decorations last week and I was feeling a little depressed about my naked house. Don’t tell me I’m the only one feeling like that after boxing up Christmas stuff? I know some of you have it down the day after Christmas, while I’m over here thinking the green would look so nice for St Patricks day. I’m totally kidding, mostly. But while your here, lets talk about my theme for Christmas this (last) year. I was really inspired by all of the plaid I saw, mostly at Target, and decided to go with black and white plaid. Its really interesting that I never even owned a plaid shirt until after I decided to decorate my house like this. Now I own five of them, what can I say? When I commit to something, I commit. Since I change up my tree every year, I like to be able to reuse things I have on hand and add a few things here and there to my collection. Because of the plaid theme, I was able to do it very affordably this year, as the ribbon and black ornaments were the main things I needed. One of the best decorating tricks I learned (from my uber gifted MIL), was to add sprigs of evergreen and foliage into the tree, before you put the ribbon and ornaments on. I added about four different types of branches, and about ten each for this nine foot tree. This not only gave the tree more dimension, it made it seem more full and grand. 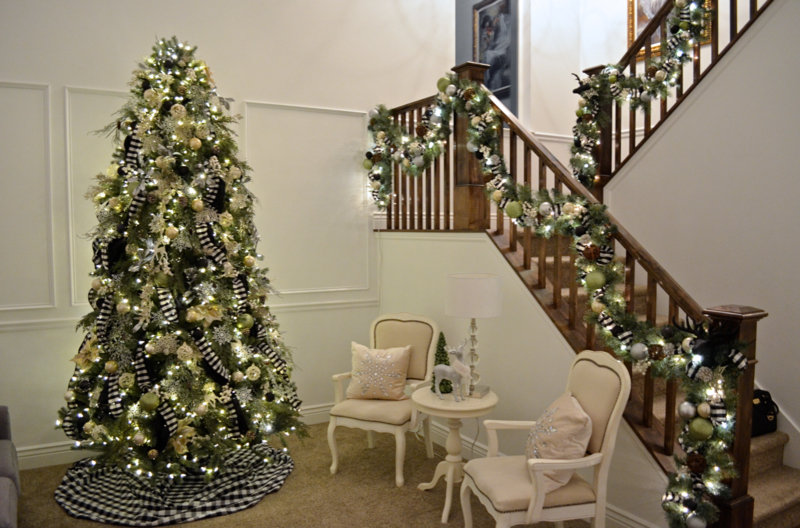 These pictures don’t really do it justice but it was one of the most beautiful trees I’ve ever decorated. The bannister is always my favorite thing to decorate. Its the first thing you see when you come into my house and it just ties everything together. Normally, when I decorate the bannister I use tons and tons of those green wire ornament hangers and twisty tie the ribbon in every spot. It takes SO long to put it up and even longer to take down. This time, I just tucked in the ribbon and used the ornaments and garland to hold it into place. It worked so well, taking it down was a dream! In no particular order, I arranged ornaments and pinecones along the ribbon and viola, gorgeousness! I did move the painting (that would normally go behind where the tree is) and it looked great and really filled the space on that big white wall. The last tip I have for you would be about the pillows. Did you know you could buy pillow covers on Amazon for around $5!? Yeah, pretty awesome! So besides the snowflake pillow, I bought inexpensive covers for all the others and LOVE how they transformed the room for almost no money. Thats what I call a Christmas miracle. Thank you for checking out how I decorated my house, even though we’re well beyond the holidays. Just think of it as getting a VERY early start on next year!